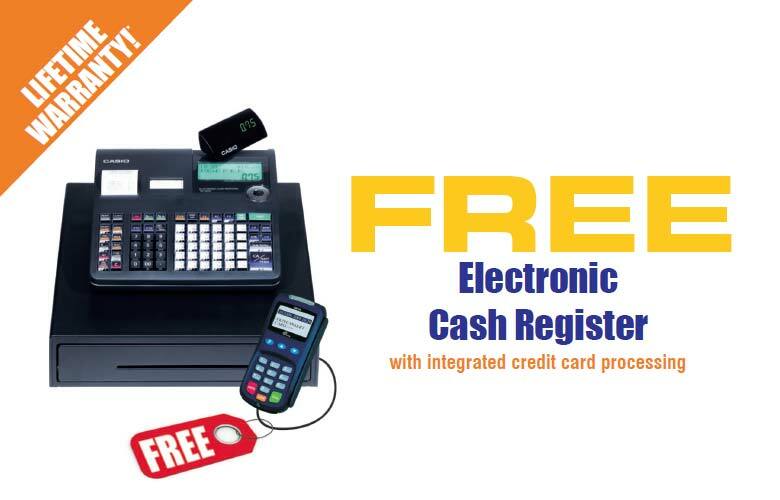 Get a free Casio® electronic cash register with integrated credit card processing when you apply and get approved for a 3-year merchant contract. Accept all major credit credit card payments including Apple Pay, Android Pay, NFC, and EMV. If a new POS system isn't in the cards at this time, but you still need a way to accept cash register sales, take credit card payments, track your daily till, receive check payments, and manage non-taxable and taxable sales, you can get the next best thing for free. With our Casio electronic cash register system for small business from our partner Harbortouch, you can easily accept payments and sales with integrated technology that allows you to accept credit card payments through your cash machine and credit card processing terminal. New cashier machines aren't as complicated to program and customize as they used to be. Harbortouch devised an easy-to-use web interface to process your register's buttons before shipping, so you receive your cash register pre-programmed, saving you an enormous amount of setup time. We currently offer our free program locally and nationally. Dallas POS Systems has partnered with Harbortouch & Casio to offer free electronic cash registers with integrated credit card processing. 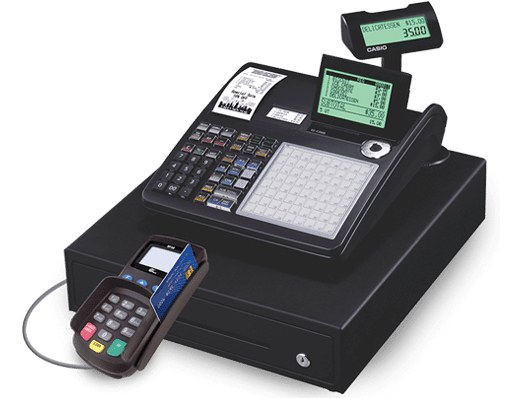 Harbortouch's exclusive technology delivers a truly integrated payment solution for your retail, restaurant or small business and it's yours free! Also, get low credit card processing rates. If you have an existing merchant provider, we'll match or beat your current service. Accept all major credit cards directly through your electronic cash register, including Visa, MasterCard, Discover Network and American Express. Customize your keypad layout with a simple, user-friendly cloud wizard. Track your daily cash, check and credit card sales as well as taxable and non-taxable sales. Award winning 24/7 customer services & technical support from our corporate office in the USA. No overseas support number. Only 1 number to call. Low credit card processing rate guarantee. Use dial-up or ethernet connection for card processing. Large LCD display and backlit customer display. Drop and load thermal printer. PCI PED complaint*. 3 function keys and 30 department keys. *PCI PED compliance indicates that this equipment meets a set of strict regulatory security requirements set forth by the PCI Security Standards Council for merchants and merchant service providers regarding the storing, processing and transmission of cardholder data. **See Terms & Conditions for complete details.